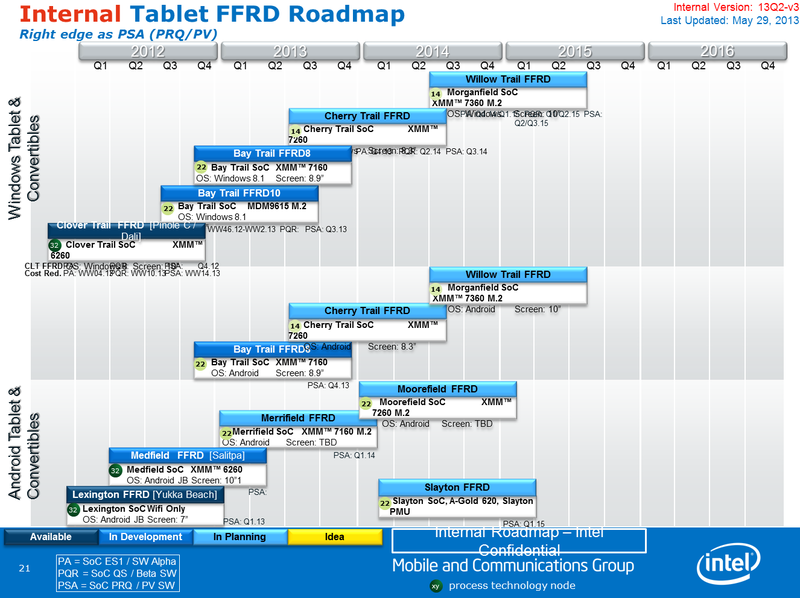 The latest Intel Atom SOC roadmaps have been leaked detailing the upcoming 14nm chips for both tablets and smartphones devices. 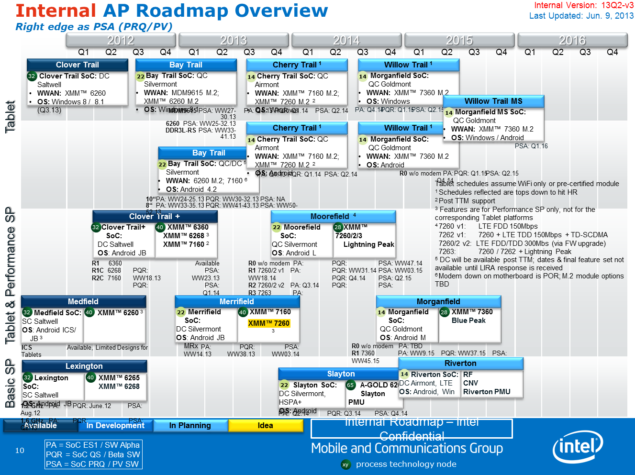 It is known for a while that Intel’s next generation Atom architecture would be the 14nm based Airmont which will replace the 22nm based Silvermont cores but the roadmap has also listed Intel’s future Goldmont architecture that will arrive in 2015. 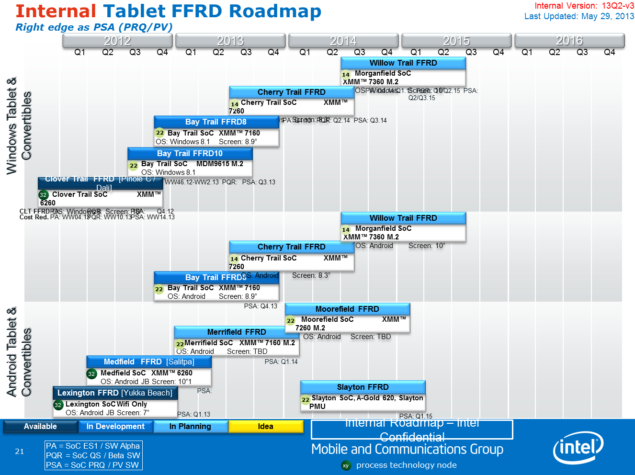 The Intel Atom SOCs would be available in a range of different devices that include High-End tablets, Mainstream Android Tablets, Performance Smartphones and the entry level Android Tablets and Smartphones. Based on the 14nm architecture, both Airmont and Goldmont will offer several performance and power enhancements due to the new architectural design. 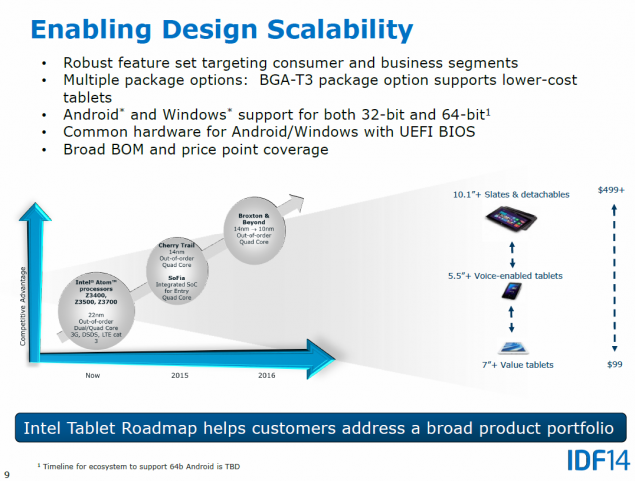 The Intel Atom 14nm Airmont will be integrated for various form factor devices. 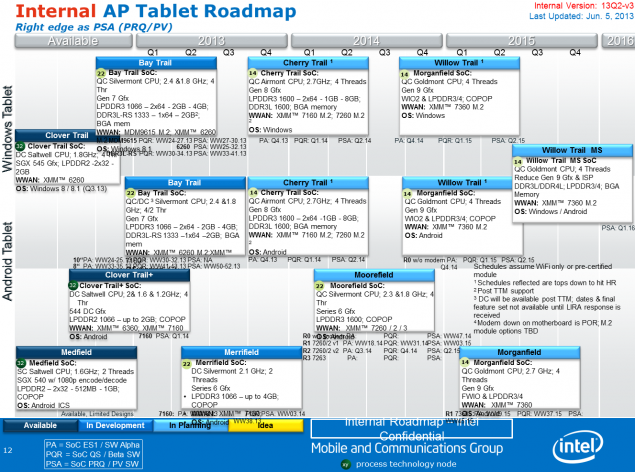 Starting with Tablets, the cores would be featured inside the upcoming Cherry Trail SOC which feature will range in both Windows and Android powered tablets. Similar in specifications, the different OS based tablets would feature 4 Airmont Cores and four threads. The clock speed would be set at 2.7 GHz and would include Gen 8 graphics. 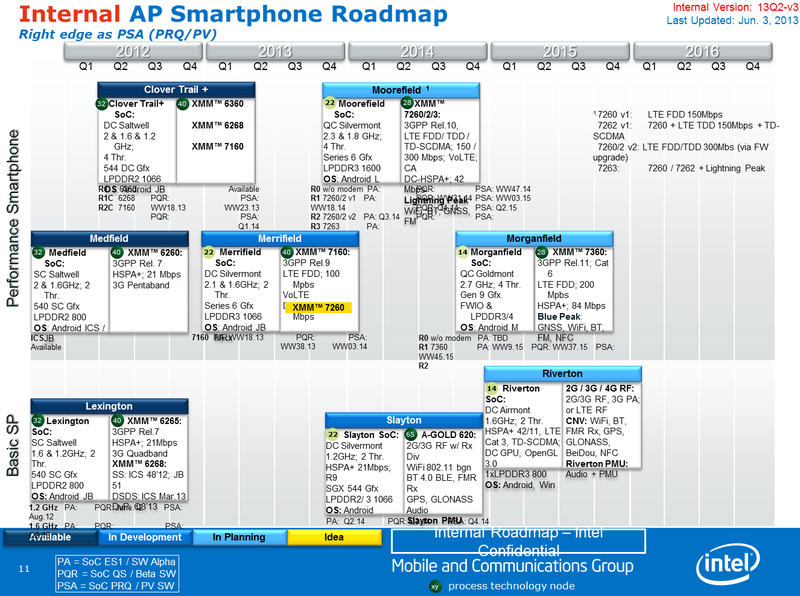 The chips will be able to support LPDDR3 memory of 1 – 8 GB (1600 MHz), DDR3L Memory (1600 MHz) or soldered BGA memory. Both variants will support XMM 7160 M.2, 7260 M.2 WWAN and will be available by Q2 2014. 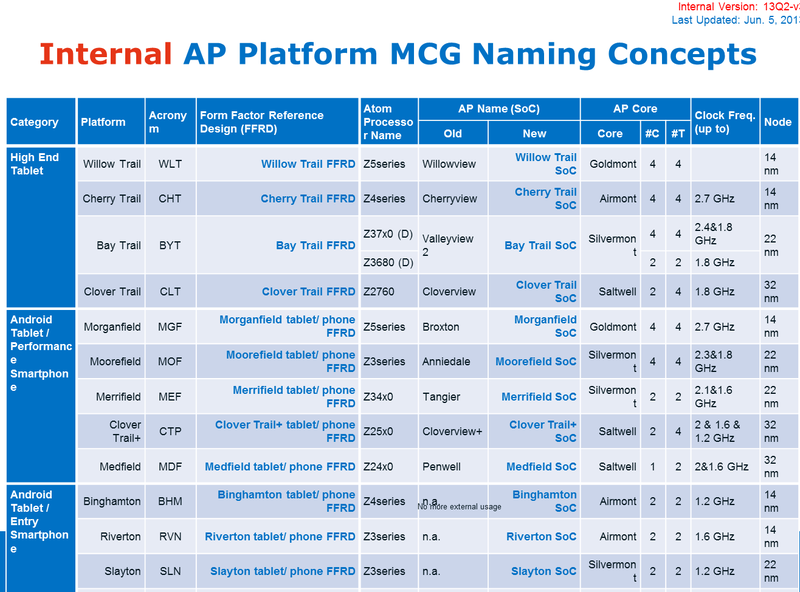 The Cherry Trail SOCs will be branded as the Z4 series while the current Bay Trail SOCs are labeled as the Z37*0 series. Moving on, we have the 14nm Goldmont architecture which will be featured in the Willow Trail SOCs for high-end tablets. Featuring 4 cores and 4 threads and a yet-to-be defined clock speed, the SOC will support Gen 9 graphics and LPDDR3 or LPDDR4 memory along with XMM 7360 M.2 WWAN. This design would be aimed towards both Windows and Android based systems. A third variant would introduce Dual OS architecture and would feature DDR3L/DDR4L/LPDDR3/LPDDR4/BGA Memory. This chip is mentioned at Willow Trail MS and will be available during late 2015. On the Android side, the Morganfield SOC will feature a 2.7 GHz clocked Quad Core chip with Goldmont architecture, Gen 9 graphics and LPDDR3/4 memory support. Cherry Trail and Willow Trail would also end up in several Windows tablet, Android Tablets and Convertibles in 2014 and 2015. 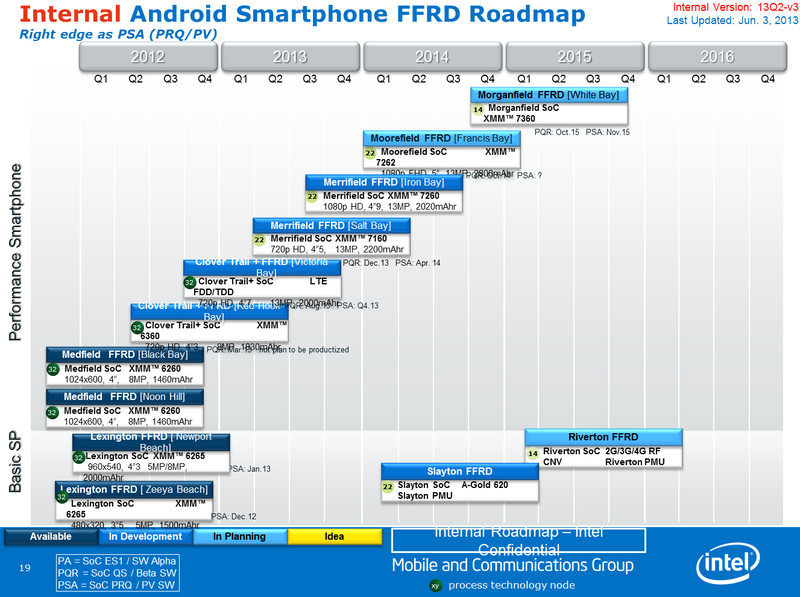 Android smartphones have been a boom for the tech industry and Intel will be releasing two SOCs codenamed Francis Bay (Airmont/Moorefield SOC/ XMM 7262) in 2014 and White Bay (Goldmont/Morganfield SOC/XMM 7360) in 2015. Slayton SOC with Airmont or Goldmont architecture would be an entry level offering followed by Riverton SOC with 2G/3G/4G support in 2015. These SOCs will replace the current Lexington based devices. 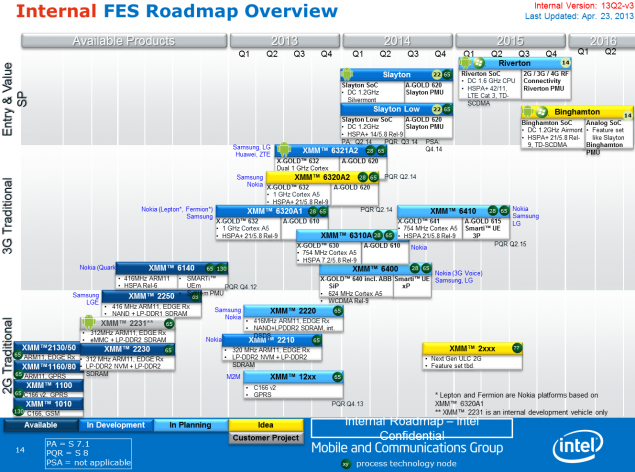 Performance smartphones in 2014 will be updated with the Moorefield SOC featuring two variants, one based on Silvermont while the other is possibly based on the Airmont SOC with LTE and Lightning Peak controller. The 2015 Morganfield SOC will be adopted in the 2.7 GHz (4 C/ 4 T) smartphone model with Gen 8 graphics, LPDDR3/4 and Android OS. 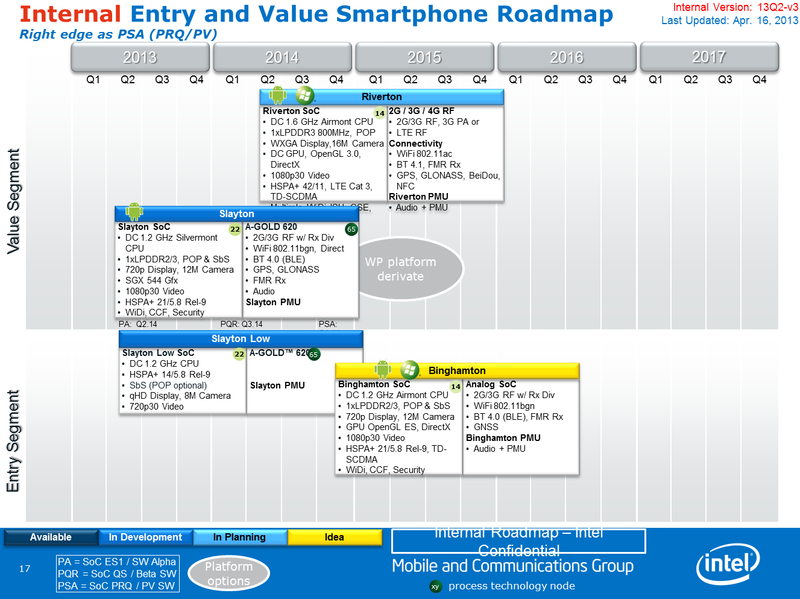 The basic smartphones which are the budget offering will feature the Riverton SOC with dual core Airmont based chips clocked at 1.6 GHz and two threads. These will feature HSPA+, LTE Cat 3, TD-SCDMA, OpenGL 3.0 and LPDDR3 (800 MHz) with both Windows and Android OS support. The first generation WWAN XMM 7260 would be rated LTE FDD 150Mbps while second generation would be LTE FDD/TDD 300 Mbps (via Firmware update). 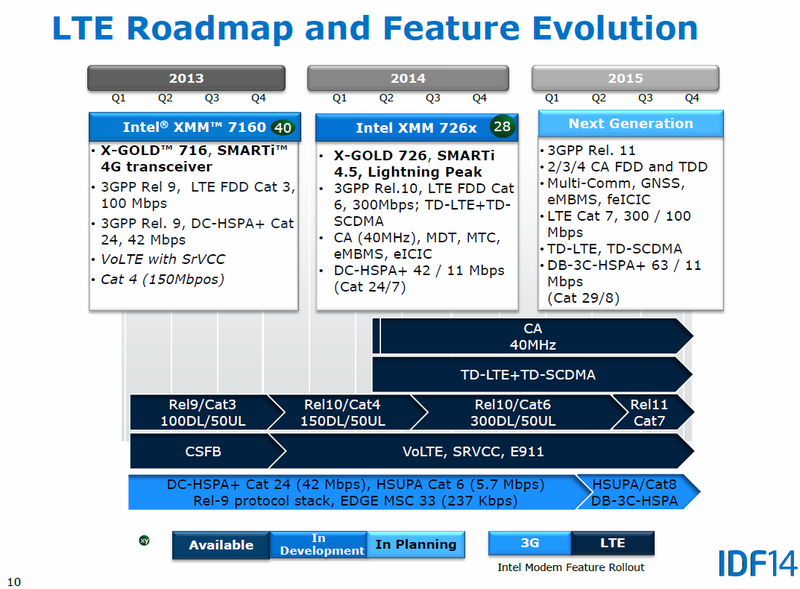 The WWAN XMM 7262 would be the first generation XMM 7260 with LTE TDD 150 Mbps and TD-SCDMA. There’s also the XMM 7263 WWAN with feature set of both 7260 and 7262 along with the Lightning Peak thunderbolt controller which is the first low-power Wi-Fi and Bluetooth combo solution for phones and tablets. At the developer forum in China, Intel PC chief Kirk Skaugen told Intel employees about Intel’s hopes to help Google grow its Chromebook and Chromebox business as well. Chromebook, as we know is a growing sector of the notebook market. The notebooks run Google’s Chrome OS and are generally cheaper than $ 400. Intel also claimed that the chip will now boost the notebook designs of Chromebook to 20 in 2014 from four previous year. The move might also be aimed at attracting more manufactures to manufacture the Chromebook. We can also expect better power efficiency and a significant power boost from Braswell as well. This is due to the shrinkage in its architecture. It will therefore be able to power budget laptops and desktops much effectively. The chip will also make use of the Intel Iris. The SoC design, Intel claims will reduce the overall size of the final product as well as the number of supporting chips required.